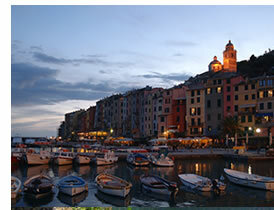 I first visited Portovenere 15 years ago on a long walk from Levanto, through the famous 5 Terre, in Liguria, Italy. However, Portovenere is as beautiful as I left it all those years ago. I happen to think it even better than its famous ‘5 Lands’ cousins to the North, for whom it acts for many as a springboard. The church of S. Pietro, on the raised spur facing the Med is one of the prettiest – and most spiritual churches – I know. The multi-coloured town which stretches out below is more or less formed of three streets, a castle above and a small port below. Portivene – Un Mare di Sapori, Via Capellini. Andrea, the chef and owner is very friendly indeed. He has created this little sea-food antipasto place (a few more substantial dishes available) and runs it with passion. The prices are honest, the fish is freshly caught and cooked and the three little bolted to the wall tables in the street are very romantic, especially at night time. A bottle of wine, fresh fried fish and beautiful company and what more could you ask for? Olioteca Bansigo, Via Capellini 95. I don’t usually recommend shops, but this is a very very good one. A friend of mine, who truly knows her food, recently gifted me the ‘best’ balsamic vinegar there is. When I walked in and saw this amongst the things they sell, I knew this place must be good. Their olive oils, if not cheap, are at least fantastic and two personal – cheaper – favourites of mine are their sea salt and herb mix, which has replaced salt in my kitchen and their amazing oliveoil based soap scrub. Oliotecabansigo. Bajeico – La Bottega del Pesto, Via Capellini 70. Bit of a theme here? All the same street… Well there are only three and one of which has all the shops so… Anyway, simple this one; if you like pesto, quintessentially Ligurian, make a stop here and buy the best you’ll ever have tasted. I used to spend a lot of time in Liguria and think I know my pesto pretty well. It doesn’t get any better than Bajeico. How do I purchase Pesto Di Bajeico? Bajeico la Bottega del Pesto. Bought some in October and It is the BEST! We just returned from Portovernere this week and purchased a few of the little jars of the pesto – I was concerned about trying to bring anymore back to the US in my suitcase… I could kick myself, it’s the best pesto I have EVER tasted! I’m serching the web to see if they have a site or way to ship to the US? I am trying to contact Olioteca Bansigo in Portovenere to buy and ship some items but it seems I cannot contact them. ANy suggestions on phone or how to find email?